Red Sox slugger David Ortiz became the all-time hits leader at the designated hitter position last night. 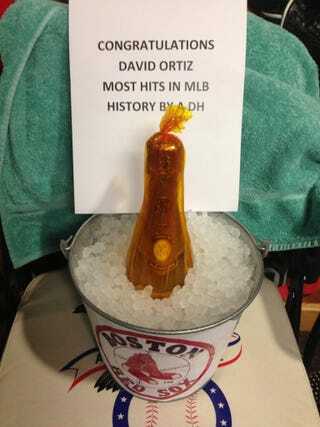 What kind of gift did the Red Sox get him to celebrate the occasion? Based on the photo above, which came from teammate Jacoby Ellsbury's Twitter account, all he got was some champagne and what might be the saddest congratulatory note of all time. I've seen signatures in office birthday cards that have more heart than that.